A perfect gift for that Adventure Couple in your life…maybe it is you and your honey! A beautiful, hand painted ceramic ornament hung from a suede cord. 3 in x 4 in ceramic ornament crafted from stoneware clay for durability and beauty. Each ornament is hand painted and may vary from the photo above. The beauty of handcrafted! Do you need a gift for a couple that loves to Adventure Together? Maybe it is you and your loved one who enjoy spending time in nature together, then this ornament is just for you! 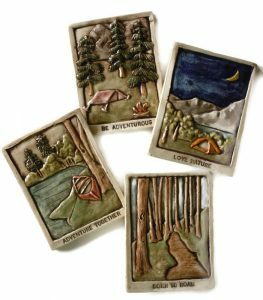 A beautiful, hand painted 3 in x 4 in ceramic tile ornament, crafted from stoneware clay for beauty and durability. Do you love this piece but would rather have it as a tile to install in your next tile project? You can find this piece as a tile HERE. Every ornament is hand painted and may vary from the photo above. You can find our tile process HERE. Grab this sweet, unique ornament today!